Posted on January 21, 2019 at 7:39 am. Security vulnerabilities are nothing new when it comes to tech. Every day, we are increasingly and often unknowingly putting ourselves at risk for digital intruders. Doorbells, hot tubs, baby monitors, Facebook, Google+ and yes, website hosting companies to name a few. The consequences include potential access to your accounts, sensitive information, or worse. Paulos identified dozens of bugs that vary in severity and allow hackers access to sensitive information, full account takeovers or both. Given the importance of security, it’s worth noting that the article says the vulnerabilities have been fixed. That said, it may be time to invest in a higher quality hosting company, especially if you use a popular content management system (CMS) like WordPress. Posted on April 24, 2018 at 7:43 am. Sometimes our clients leave us. And it always makes me sad…especially when they move to a different provider, who insists on them paying for an “updated” website and locking them in for a multi year contract. Especially, when they were already on a very good, well built WordPress site. But it’s even worse, when this website redesign underperforms. Immediately and drastically. Our ex client, experienced this as a 44% decrease in website traffic that rolled out immediately after her new site launched. No new content, no changes in backlink profile, no changes to her local tactics or platform. Just a new website on a vendor’s proprietary platform, that frankly can’t compete with her, ahem, “old” (and in this case, the site was about 4 years old) WordPress site. In the off chance that this was a random change in tracking infrastructure, we further validated the data above in Google Search Console – the results mirror the significant drop in search traffic – 44% in fact – once the law firm migrated away from WordPress. Take this as yet another example of the value of a well coded WordPress website, which intrinsically outperforms proprietary platforms. Now, not all WordPress sites are created equal – in fact many of the widely available and utilized templates are extremely poorly coded from an SEO perspective. (This is the part where I tangentially brag about our developers’ collective coding prowess.) And not all WordPress sites are fast – great hosting (in our case, WPEngine) is important – efficient code is important – expertly compressed imagery is important. In our case, we tend to obsess over those things. Now our ex client is seeing a 44% drop in her website traffic. And because she is heavily dependent on the web for client development, presumably a 44% decrease in business. And it’s a real shame if she’s locked in for a multi-year commitment. I’m not saying you have to work with us – just be aware that platform matters. I apologize if this comes across as bitter…and yes, there’s a little bitter taste in my mouth…but I hope you can avoid the same mistakes she made, even if it’s not with Mockingbird. Posted on March 9, 2017 at 9:29 am. Further – it’s highly unlikely that Google will send anyone to any other pages on the site…. most likely, the only results you will get are for that flagrant brand queries. 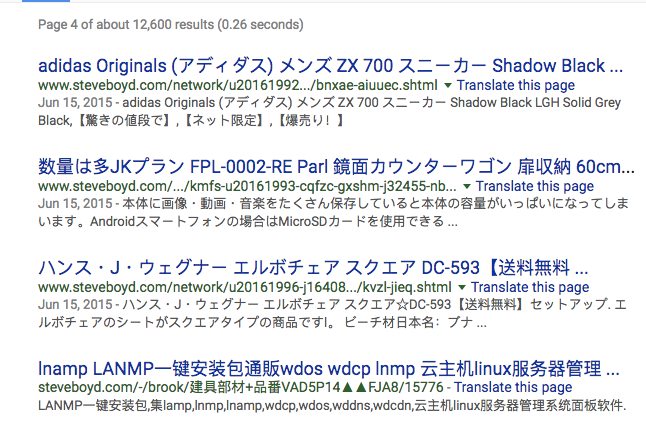 And this is because the site has over 12,000 indexed pages, mostly in Japanese, peddling everything from Nike sneakers to Patagonia jackets. But wait – there’s more! 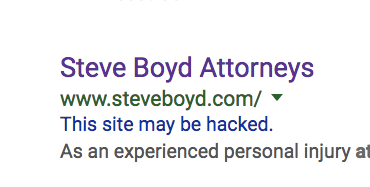 Go back to that original result and let your eyes land on the pictures to the right in the Knowledge Graph….. looks like not only Steve’s site was hacked, but someone also took the time to upload some new pictures for his office. Either that, or Steve really likes galavanting in one-size-too-small football pants after taking a dip in the ocean and completing his morning’s 1,000th sit-up. Host it on a Managed WordPress provider. We recommend WPEngine – read more: Our Love Affair with WPEngine. Check results for brand searches regularly. Claim your Google My Business result. Monitor your site in Google Search Console. And Steve – if you are reading this…. my apologies (or admiration if that is really you). Posted on April 19, 2016 at 10:57 am. Posted on September 18, 2015 at 9:40 pm. Echois our amazing new marketing platform. We take the tools that we use everyday as an agency for our clients who are paying us $5,000-10,000 a month and we bring them into your law firm. We also have video tutorials that talk your through how to use these tools. There’s a lot of really confusing stuff out there, and we provide step by step instructions on how to use them. Analytics.How do we use Google Analytics? What do you need to keep an eye on and what metrics matter? How do we use tools like Moz Local and Yext to bolster our local performance? Review Management.How do we make sure that when we’re reviewed on Yelp, Avvo or Findlaw that we get an email that day telling us about that review? Call Tracking.How do we implement call tracking? What is call tracking and how does it work, and what can it tell you? All of this is wrapped around business reporting infrastructure with a final goal of helping you calculate exactly how your marketing investment is performing. So you can improve your marketing by shutting off those channels that are costing you money and spending more money that are showing a positive return on investment. Echo is our amazing new marketing platform. We take the tools that we use every day as an agency for our clients who are paying us $5,000-10,000 a month and we bring them into your law firm. We use video tutorials to provide step by step instructions on how to use them. Analytics. How do we use Google Analytics? What do you need to keep an eye on and what metrics matter? 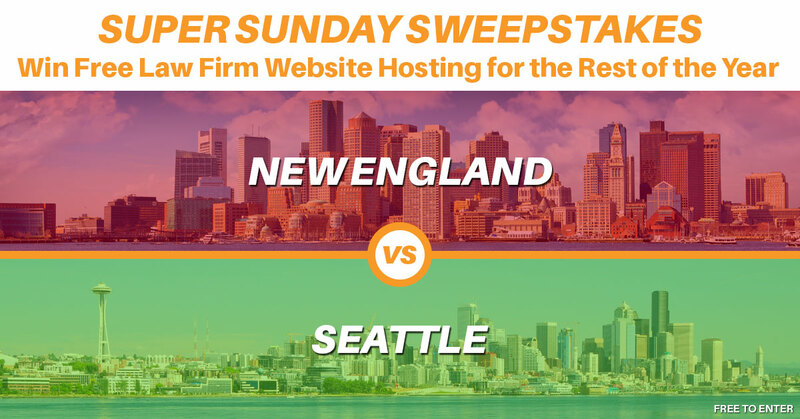 How do we use tools like Moz Local and Yext to bolster our local performance? Review Management. How do we make sure that when we’re reviewed on Yelp, Avvo or Findlaw that we get an email that day telling us about that review? Call Tracking. How do we implement call tracking? What is call tracking and how does it work, and what can it tell you? WordPress. We use WordPress websites to power our legal-centric and responsive designs hosting on the amazing WPEngine. How do you use Google Webmaster Tools to track the real performance of your site at the keyword level, instead of relying on ranking reports? (or both for $500)Learn more at echo.mockingbird.marketing or sign up for our Webinar where we’ll tour all of this awesome functionality. Posted on February 25, 2015 at 7:07 pm. Posted on February 17, 2015 at 9:36 am. We’ve finally completed a long overdue look and feel update to the website. Like the barefoot cobbler’s children, we’ve been in need of a website redesign for some time now. We’re also very proprietary about our client list and now, finally have a good site (our own) to reference. The primary job of a website is to make the phone ring – check out the cool custom persistent header that maintains the phone number when scrolling. Built on easy to use (and easy to transfer) WordPress creating a custom look with limited incremental expense and automatically responsive. Hosted on managed wordpress provider WPEngine – more expensive at $29 monthly, but thoroughly worth it. Yoast plug-in configured, GA-Code transferred. 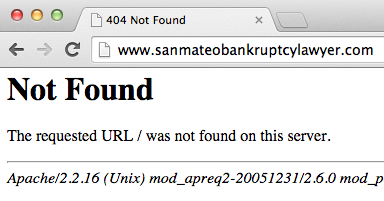 Legacy URL’s checked and redirects installed where necessary. And how much should these cost? Had we billed our new site to a client – it would have come in at just under $4,500 – keep that in mind every month writing that $1,000 check for your website. Posted on December 5, 2014 at 8:12 am. There are many ways to radically improve site speed, but the simplest is often to change hosts. Take Client X, for example. Before our engagement, their website was on a host that technically did it’s job by keeping the website online, but left a lot to be desired in terms of site speed. We recommended they make the switch to our favorite host, WP Engine. They agreed, and we saw a drastic improvement in their site speed. According to pingdom, the average load time went from ~6.29 seconds to ~1.2 seconds. Not perfect, but quite literally 5x faster than the site was on it’s previous host. WP Engine credits their remarkable site speed to their proprietary EverCache system – their “secret sauce” that makes their websites perform. We’re also fans of their speedy servers, expertise on how to optimize for wordpress performance, and stellar customer support. As an added bonus, they “automatically scan for, and fix, hacking attempts” to your website. Last but not least, they automatically backup their sites on a daily basis, which has been a lifesaver more times than we can count. Granted, WP Engine is slightly more expensive than other hosts, but at $29/month it’s not exactly breaking the bank. Plus it’s completely worth it. As you may recall, Google takes site speed into account when determining rankings. Switching to WP Engine -> faster website -> better rankings -> more traffic to your website -> more phone calls -> more clients. And did we mention automatic backups? And if you’d like some help with the transition . . . we’d be happy to lend a hand . . . between Mockingbird and WP Engine the only thing you’ll notice is your site’s new lightening fast load speeds. And while we are talking about hosting . 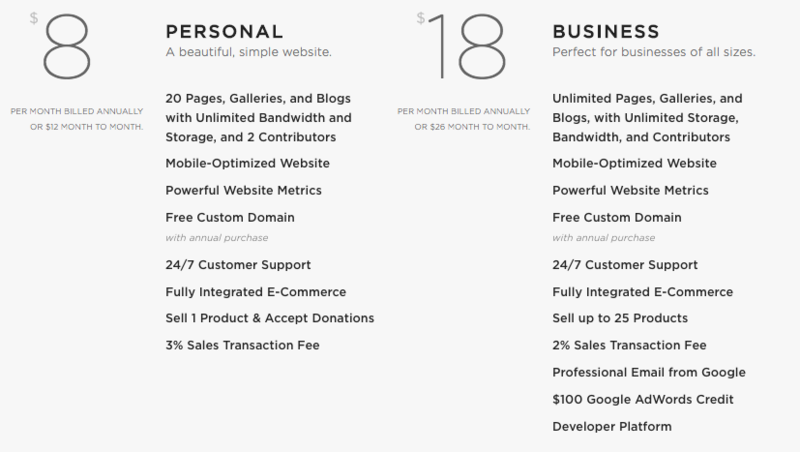 . . if your provider charges you a penny more than $29 monthly to host your website, you have been taken to the cleaners. P.S. In our humble opinion, the best customer support person working at WP Engine is Michael Anthony. He’s awesome. Seriously, somebody give that guy a raise.